Here's a singer you've probably never heard of – but who stands right up there with the best UK pop acts of the late 60s – both a vocalist and a songwriter, gifted with a wonderfully catchy ear for a tune! 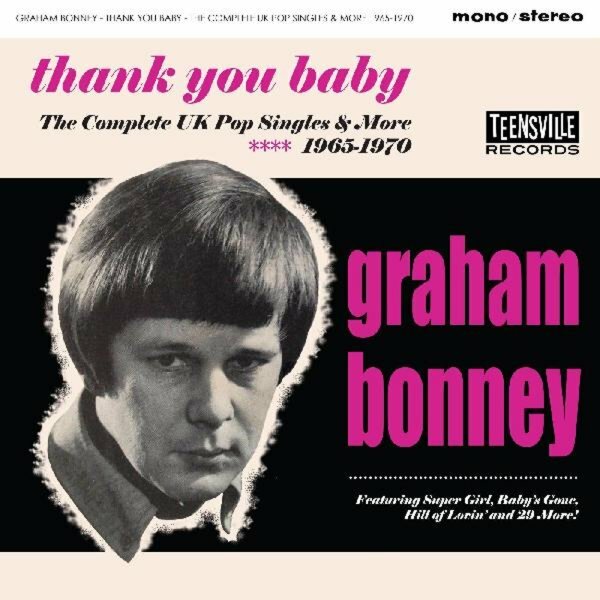 Graham Bonney's got qualities here that resonate nicely with work of the time by The Hollies or Herman's Hermits – songs that might evolve into classic rock, but which are plenty fantastic in their own right – these little mini-symphonies of pop, usually just two or three minutes in length, and really perfectly put together! This package might be the first we've ever seen to do justice to Bonney – a singer who primarily recorded for Columbia Records in the UK, but hit bigger success in Germany – although not enough to get his records played over here on radio in the 60s. The set's got an insane 32 tracks in all – more even than his issued singles of the 60s – and titles include "Super Girl", "Briony", "That Bad Day", "Later Tonight", "No One Knows", "Frenzy", "Back From Baltimore", "Papa Joe", My Jenny", "Devil's Child", "Mixing The Wine", "Leander Angeline", "Fly Me High Lorelei", "Sunny Has Gone", "When Evelyn Was Mine", "Why Can't We Be Friends", and "Did She Tell You". © 1996-2019, Dusty Groove, Inc.